What's it about? 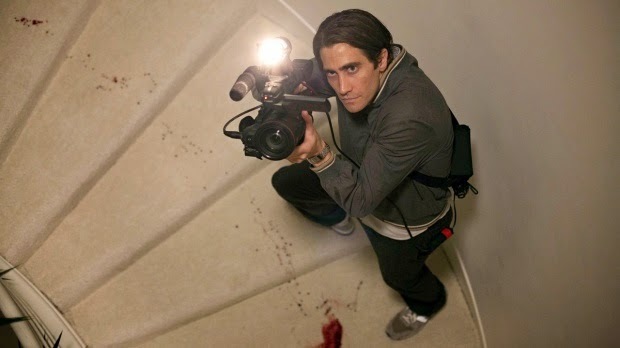 Petty thief Lou Bloom (Jake Gyllenhaal) realises he can make money selling graphic footage of crime scenes to news stations, a job he turns out to be frighteningly good at. Is it any good? A pretty good directorial debut from Dan Gilroy, coming across as a contemporary update on 70s classics like Taxi Driver (with its central, night-cruising anti-hero) and Network (with its commentary on media entertainment). It's not as good as either of those, but it's a agreeably claustrophobic thriller with a terrifically slimy turn from Gyllenhaal as the sociopathic Bloom (presumably his name a reference to Joyce's Ulysees). Yes, his approach to his work may be immoral and criminal, but maybe that just reflects his clear-eyed ability to see exactly what people want and how he can give it to them, whilst they hypocritically faff around with irritating things like small-talk, ethics and emotions. However, as a commentary on the the current state of the media and the public appetite for graphic news stories, it's a bit superficial - it could have done with a little extra BAMF! to support Gyllenhaal's excellent performance. Anything else I should know? Award yourself 10 geek-points if you get that BAMF! joke above. What does the Fonz think? Crime does pay, it seems.